350 pages | 165 B/W Illus. 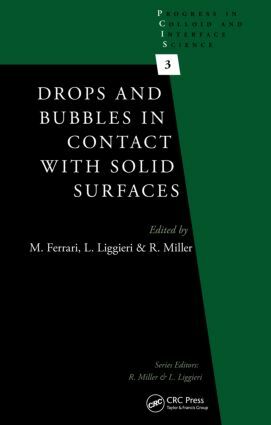 The third volume in a series dedicated to colloids and interfaces, Drops and Bubbles in Contact with Solid Surfaces presents an up-to-date overview of the fundamentals and applications of drops and bubbles and their interaction with solid surfaces. The chapters cover the theoretical and experimental aspects of wetting and wettability, liquid–solid interfacial properties, and spreading dynamics on different surfaces, including a special section on polymers. The book examines issues related to interpretation of contact angle from nano to macro systems. Expert contributors discuss interesting peculiarities, such as the phenomena of super-spreading and super-hydrophobicity. They discuss specific solid surfaces—for example, reactions and wetting of liquid metals at high temperatures—and the interaction between nano-bubbles at solid surface and nano-particles at liquid interfaces. The book also includes a chapter on electro-wetting. Given the range of topics covered in this volume, the state-of-art content is useful to readers looking for an introductory overview as well as those looking for in-depth exploration of material related to the interaction of fluids with solid surfaces. It is a valuable contribution to the field of characterization of solid surfaces and can be used as a working tool or to stimulate further study for researchers and students.